A Fourth of July wreath. I did a Google search for 4th of July wreaths & I really loved this one. It was very simple (but a little time consuming) to make & only cost me $10! Check out The Creative Imperative for directions. Yesterday was game day. It was a lot of fun & both the kids enjoyed it. & I LOVE LOVE LOVE when they play together! It makes my heart happy! Addy decided to build a bridge & castle with the Jenga blocks instead of playing the game! P.S. I'm pretty sure Hungry Hippos is their favorite! Months ago, I came across a wonderful blog called Diary of a Mom written by a mom of 2 daughters, one with autism & one developing typically. And from there I have found my way to a whole network of blogs written by parents of children with ASD. Lately, I have taken a lot of time & sat & read these blogs. As I read the stories I'm filled with so much hope, yet also jealously & guilt. I read some & I'm jealous that that's where their child is on their journey & that Addy is not there yet. And then I read some & I feel guilty that Addy is doing so well & their child is older than Addy but not where she is. But I am so proud of my sweet girl & I love her just the way she is.The fact that she has some social issues & limited speech does not change how much I love her. But sometimes I get sad. It's hard for me to accept that my child may not (& probably won't) have the same childhood that I did. & I wonder a lot what she is going to be like as a teenager. Will she ever go to sleepovers at a girlfriend's house. Will she ever be gone for hours with the neighborhood kids exploring. Will she ever spend hours on the phone talking to friends. Will she ever go on dates or to school dances. What will it be like at school for her? Will she connect with the other kids or will they be mean to her? Please God don't let her be bullied. I worry about all this because SOCIAL & speech are where she is delayed the most. It's tough to be the parent of a child with ASD. I pray a lot for her. That God watches over her & helps her "catch up". And I worry a lot too. I worry that I spend too much time focusing on her & don't give Alex enough attention. And then when I read some of these other blogs I worry that I don't spend enough time on her. She only receives speech & OT once a week & some of these other children are getting 15+ hours of therapy a week. If we had her in more therapy would she be talking more? What if we could afford a private school for ASD children.Would that make all the difference? Would she be 100% potty trained? Would she be doing better socially. There are so many what ifs. When I look at Addy I don't see ASD. I don't see PDD-NOS. I just see my beautiful perfect child. I know that she does have delays but to me they are not severe. And they make her who she is. Is that a problem? I don't know. When we get reports or go to the doctor, I cringe inside. Because like I said, I don't see her delays as severe. But that nasty little "s" word often pops up on her reports. And then I think that it's my fault because if I saw her delays as severe, then I would do more to help her. And then I'm torn, because I love her just the way she is & don't want to change her. When we moved to Sienna, I set up an ABA evaluation for Addy. She cried through the whole thing & I hated it. It seemed too rigid & demanding for my sweet little girl & I couldn't sit through that just letting her cry. So I said, thanks, but no thanks, we won't be doing ABA. I just didn't think that Addy needed therapy that structured. So I opted to go with the Floortime approach. But was that the right decision? What if we would have done the ABA? Where would Addy be now on her journey? Further along? At the same place? More delayed than she is now? There's no way to know. All I can do is to do what I feel is right for her. And if something is not working, change it. My favorite autism blog that I've read so far is Adventures in Asperger's. (You should really check this blog out, it's FANTASTIC & funny & cute.) It's written by a dad (nice to see a dad's point of view) with an ASD son. I love his take on life with autism. I find myself reading & saying "oh yeah, we've been through that!" Especially the food issues! So here's my take on autism... Mostly, I try not to get down about it & say "Why me" or "Why Addy?" But I'm human & a mom so every now & then I do. Every now & then I get sad & worried & PISSED! Even though PDD-NOS does not define Addy, it is definitely a part of her. And a big part, at that! And if Addy did not have PDD-NOS, she wouldn't be who she is. So instead of feeling sad & depressed about it, I welcome autism into my life, BRING IT! Sometimes you don't realize how much you love something until it's gone. That's how I've been feeling about rain! Texas is suffering from one of the worst droughts in 40+ years & it's killing me. I love the sunshine, but I also love a good rainy day! It's so dry that I've been hoping for a hurricane! (Not a bad one, just a category 1 or 2 to bring on the rain.) And let's not mention the cost of my water bill lately. So today I gladly missed a trip to Moody Gardens & the beach because it was RAINING! But the kids & I still put on our swimsuits (& raincoats) & went outside & played in the water. We had a blast & hopefully this summer we'll have many more days like this! This year I decided to try planting a garden. I started with tomatoes & jalapenos & I ran into two major problems, Pepper & Alex! Pepper ate all the unripe vegetables! And Alex kept digging in the plants. Oh no! How was I going to keep them out of my garden? So Nick suggested a potted garden & we decided that would be the best idea. And to put it OUTSIDE the fence! So now we are growing tomatoes, jalapenos, basil, cilantro, corn, okra, cucumbers, strawberries & watermelon. I ran out of pots so I had to improvise a little! Lol! I never knew cilantro flowered! ...how to blow bubbles in his drink! He's quite proud of himself! Addy was OUT OF CONTROL yesterday & that is just not like her! Even though she is on the autism spectrum, she is high functioning & normally doesn't have any behavior issues. But today was a different story. It started first thing in the morning. She woke up & Nick brought her & put her in bed with me. She was talking & singing, so I brought her in the living room & told her it was time to get up. Then I went back to bed. When I got up an hour later, Nick said "Addy must be mad at you!" I asked why & he told me to go take a look at what she had done. She took all the toys from the shelves in the playroom & threw them on the floor. And Nick said that she didn't even play with them. She just swept her arms across the shelves throwing toys to the ground! AHHH! I could not believe her behavior & if it had not been her birthday, she would have gotten in lots & lots of trouble! (Yeah right!) All day I just kept thinking, what is going on here. Am I too lenient with her? Is it because she's out of school for the summer & doesn't have that same structure everyday? Does she need to go to speech & OT twice a week instead of once or even start some ABA therapy? Whatever it was, I was really just wishing for a mulligan (golf lingo for a do over). A FULL MOON! Could this be it? Could Addy be experiencing the lunar effect? Kids with autism are more susceptible to all kinds of things, so couldn't they be more susceptible to erratic behavior because of a full moon? Nah, probably not. But at least it gives me something to blame her behavior on & gives me hope that it will get better. And guess what, today, she's back her normal self again! School's out & next year Addy starts Kindergarten. So I don't want this summer to be wasted. I saw an idea online that I thought was really cool, so I took it & tweaked it to fit my & my kiddos lives. And that is where we get 101 Summer Activites! Believe it or not, 101 activities was not very hard to come up with. I even had to scale it down. But I am hopeful that we can accomplish all 101 of these things in the 84 days of summer! Sounds like we better get a move on!!! Sweet, sweet Bailey! Oh how we love him! Especially Addy! Gives him check-ups to make sure he's feeling ok.
And carries him around like a stuffed animal. Oh how she loves him! Luckily, he's the most tolerant cat EVER! 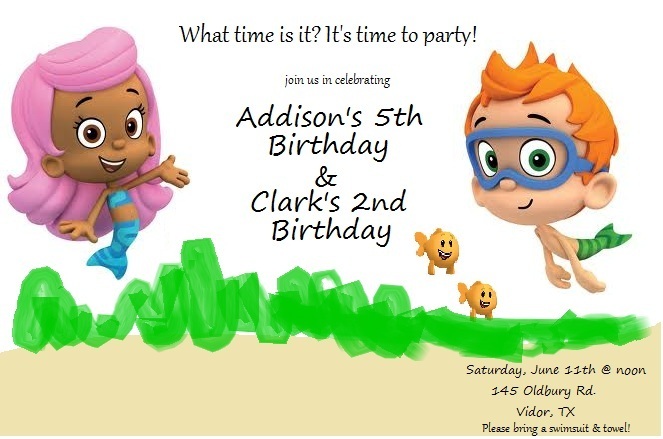 Yesterday, June 11th, we celebrated both Addison's 5th birthday & Clark's 2nd birthday. We had a Bubble Guppies (Nick Jr. show) themed party at CiCi & PopPop's house. It was lots of fun! Thanks everyone for coming out & helping us celebrate these two great kids! put with rocks from our aquarium. & drew a picture of Gil's face & Mr. Grouper. I hung blue streamers across the ceiling to look like waves. Bubble Guppies stickers & candy! We had lots of outside activities including sidewalk chalk. a water slide which was a BLAST!!! as a water table. We had little boats & fish in it. It was lots of fun! Alex loved the birthday cake! Mawmaw & Granddaddy got Addy a camera for her birthday. She's already taken a million pictures with it! Aunt Brooke got Addy this cool ABC sticker book. After she saw this, Addy was done opening presents! She opened the rest later that day! After everyone left, CiCi decided to finally get wet!!! Maryse squirting Alex with the water hose. He LOVED it! My boys! Alex was tired after all the day's excitment.